Change History presents a summary of many important changes to your account over the last 180 days. 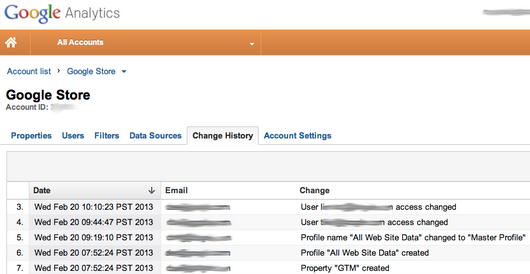 Users will find records of changes made to users, accounts, properties, profiles, goals, and filters. This feature is available only to Analytics account administrators. We are rolling out Change History to our customers over the coming weeks. Once it’s enabled on your account, you’ll be able to see it by clicking the “Admin” button in the upper right corner of the Analytics interface, selecting the appropriate account, and clicking the tab labeled “Change History.” In this new section, you will see a list of changes on your account, when the change took place, and who made the change. The new Change History helps you better understand how your accounts evolve over time, improves account collaboration, and provides an additional tool for optimal configuration. Be sure and view our help center article for additional information. Have you ever wanted to learn more about changes made to your Google Analytics account, wanted to refresh your memory as to when a particular profile setting was changed, or wondered who on the team made a goal change? Now, all of that is possible with the launch of Change History.